There are two man-made ‘so called’ foods that confuse and throw our natural appetite regulation system ‘out of whack’. The biggest villain of them all and one that most of us have heard about is “trans-fat”. 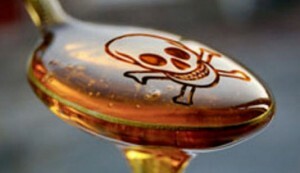 The other villain is ‘high-fructose corn syrup’ (HFCS) an extremely bad sugar. HFCS is corn syrup that has undergone enzymatic processing to increase its fructose content. Fructose is the natural sugar found in fruit and until recently it was thought to be a healthier alternative to sucrose, known more commonly as table sugar. Don’t be fooled. HFCS has proven to be a definite health risk as new research continues to link it to the exploding epidemic of obesity, diabetes, cancer and heart disease. It is a wolf in sheep’s clothing and a darling of the food industry because it is the perfect industrial ingredient: it makes foods taste deliciously sweet and it is extremely inexpensive. The hormone leptin which is responsible for telling us when we are full by signaling to us to stop eating is blocked by HFCS. Not only that, but HFCS stimulates high levels of the hormone insulin in the body where the body cannot control high blood sugar levels (and diabetes is often the end result). It tricks your body into believing it is hungry. This increase in appetite leads to overeating and you becoming overweight. You end up eating more processed food, thereby decreasing your intake of the nutrient-dense or healthy foods. It increases insulin resistance (the inability of your body to control blood glucose levels and triglycerides-blood fats). Thousands of grocery items contain HFCS, it can be found in a huge variety of foods. Soda is one of the worst culprits. You may as well tag that can of soda “HFCS in a can”. If you have to have some…use it for a treat when you have a special occasion but to keep your pantry shelves lined with this poison is a “no-no”. Bottled salad dressing, ice cream, yogurt, tomato sauce, ketchup, sports drink-even bread, cereals and cookies…they are all suspect. They have even managed to dupe the “health conscious” by sneaking it into protein bars and “natural sodas”. If you value your health you must start reading labels and eliminate HFCS from your diet. Read labels. All of them…even your pet’s food. Watch for the words ‘partially hydrogenated oils.’ Avoid purchasing anything with this in the label. Avoid frozen prepared meals as they are some of the biggest offenders…along with bottled or canned meals. Keep to the outside of the supermarket where you will find whole foods-fresh vegetables and fruits and quality products. Remember fresh natural foods do not generally have food labels. If it has a label then man has interfered with it in some way. Make a habit of baking at home using only healthy ingredients rather than buying commercially baked goods. Use only animal based fats like butter, ghee, lard or dripping or natural vegetable or olive oil for cooking and baking. For delicious treats and snacks that will have your family asking for more grab “Healthy Raw Desserts” volume 1 and 2. Not only will you have 100 mouth-watering dessert and treats to create but you get the bonus book “Best Healthiest Breads Ever”.